1. You may choose to pay your team registration(s) by check via mail. A team registration is not complete until the entry fee has been paid and all forms submitted, no later than 02/08/19. All participants, including guests, must be registered having a Participant Form AND Code of Conduct form on file with GA Envirothon. If you have any questions or issues with sending forms/payment, please contact Jennifer Standridge, jennifer.standridge@gaswcc.ga.gov, for assistance. At this time, two GA regional Envirothon competitions will be held in March of 2019, referred to as the North and South Regionals. 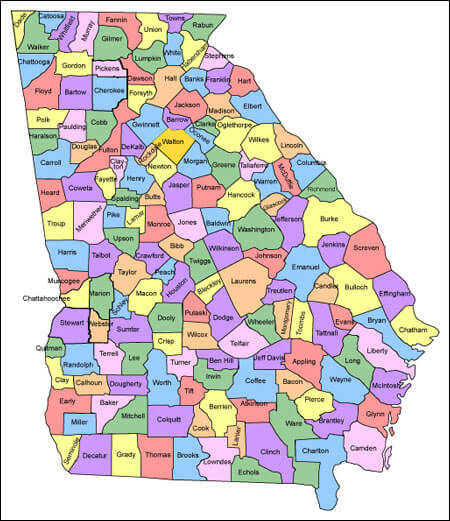 Teams residing in the following counties (Banks, Barrow, Bartow, Catoosa, Chattooga, Cherokee, Cobb, Dade, Dawson, Fannin, Floyd, Franklin, Forsyth, Gilmer, Gordon, Gwinnett, Hall, Haralson, Hart, Habersham, Jackson, Lumpkin, Madison, Murray, Rabun, Paulding, Pickens, Polk, Stephens, Union, Towns, Walker, Whitfield, and White​ ) will be asked to attend the North Regional event to be held at Fort Yargo State Park. Teams in all other counties will be asked to attend the South Regional event to be held at Gordonia-Alatamaha State Park. **The GA Envirothon Council reserves the right to make changes to event locations, as needed, or to reassign individual team competition sites based on registration numbers and/or site restrictions for space or other pertinent concerns. Your team will be notified ASAP if any changes are deemed necessary, as determined by the GA Envirothon Council. The Event and Station Coordinators make all efforts to keep the testing rigor and other related matters equalized among all competition sites.